You can always trust Wholesale Sock Deals to bring you the biggest wholesale discounts on men’s fashion essentials and we guarantee that you won’t be at all disappointed by the incredibly low prices that have brought you here in our collection of top quality men’s underwear at low bulk wholesale prices. Don’t be shy; have a good look around, because we have amazing bulk discounts on men’s boxers, men’s briefs, and Hanes men’s underwear, and that’s just the start of the incredible savings that you can make on all your wholesale purchases at Wholesale Sock Deals. We have Hunter men’s fly front briefs at the lowest wholesale prices that you will have ever seen, we have massive bulk discounts on Black Jack men’s seamless boxer briefs, and you simply won’t believe how cheap our bulk wholesale cases of Hanes men's boxer shorts are! 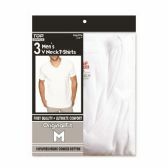 If you have a discount men’s clothing outlet or a men’s apparel retail store, or you are buying stocks for sale at charity sale or a fund-raising event, you will need a good selection of low-cost men’s underwear. Plaid, woven, knit, or seamless, the guys can’t get by without their underwear, so you know that you will always be able to sell good quality men’s briefs and boxers when you can buy them at low wholesale prices like these. Don’t wait until the store down the street is selling top quality men’s underwear at lower prices than you are. Order your selection from our range of low-cost wholesale men’s underwear from Wholesale Sock Deals and give your customers a great deal on men’s briefs, boxers, and underwear! Have you seen how big our bulk discounts on wholesale men’s underwear are? We are offering the best deals on men’s briefs and boxers on the web, so don’t miss out on this opportunity to stock your store with high-quality men’s underwear at low wholesale prices. 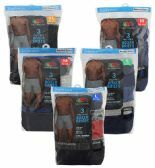 We have the biggest wholesale discounts on Haynes Men’s underwear, Tagless men’s underwear, and right across the entire range of low-cost men’s boxer shorts and briefs, so stock up the shelves of your retail store with the highest quality underwear men at the lowest wholesale prices from Wholesale Sock Deals and grab yourself a wholesale bargain. Wholesale Sock Deals are the number one wholesale supplier to the retail industry of low-cost men’s underwear and men’s fashion. We are also one of the biggest suppliers of cheap wholesale clothing to charities and disaster relief organizations. We never cut back on quality, we only ever cut back on prices. That’s why you will always find all the best wholesale deals on men’s fashion at Wholesale Sock Deals. Whether you are looking for great prices on classic woven boxers, big discounts on Fruit of the loom low rise boxer shorts, or amazing deals on bulk cases of plaid woven boxer shorts, you are guaranteed to find the biggest wholesale discounts on men’s underwear here at Wholesale Sock Deals. Whether you order a single case of men’s boxer shorts, or twenty cases of different styles of men’s briefs, we always give you free delivery on all your bulk wholesale orders of men’s underwear for your retail store.